Elizabethtown police arrested a borough man today for allegedly dealing marijuana and other drugs from his home in the 300 block of North Market Street. Police charged Samual J. Schlenbaker with three counts of felony possession to deliver, one count of criminal use of a communication facility and 59 counts of possession of drug paraphernalia. In a news release, police said they received information on March 14 about a person dealing a large amounts of illegal narcotics at an address in the 300 block of North Market Street. 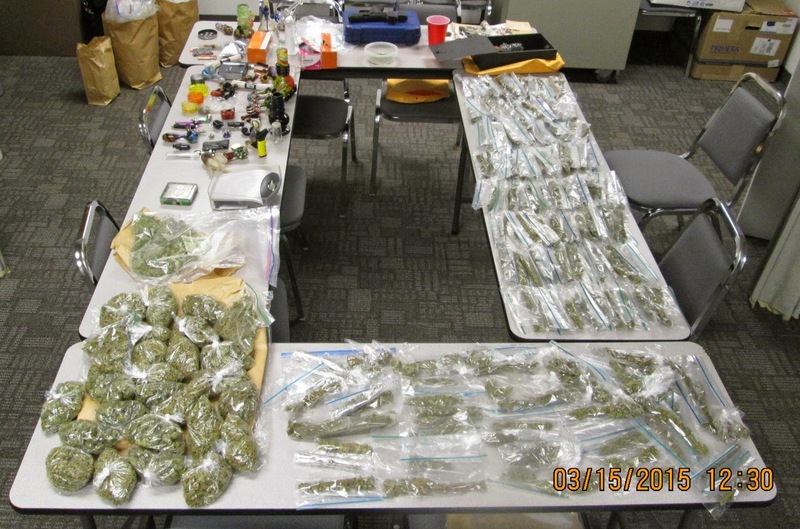 They obtained a search warrant, and officers seized more than 3 1/2 pounds of packaged marijuana, hashish and a highly refined form of marijuana known by the street name "shatter." Police also seized packaging materials and paraphernalia and a handgun registerd to Schlenbaker was found in the room with the drugs. A warrant for Schlenbaker's arrest was obtained today, and borough police, assisted by Northwest Regional Police, arrested him at his residence. Schlenbaker was arraigned before District Judge Brian Chudzick and committed to Lancaster County Prison in lieu of $250,000 cash bail.